Only users with "Account Owners" or "Manage Business Rules" privileges can view and download account Invoices. 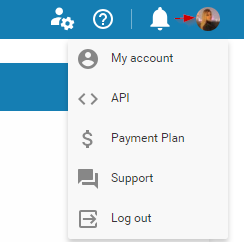 To access the Invoice storage place -> please, access your Kanbanize account and click on your avatar at the top right side of your board interface -> select Payment Plan from the menu. To proceed further, click the Last Invoice|All button to the left of the Current Subscription Details panel (img.1). - Unpaid Invoices - check for any unpaid invoices. - Payments - the number of Invoices; the method of payment; the date of payments and the respective Amount. The panel allows you to forward Invoices, create PDF files or print them - use the corresponding buttons. Note: when you make a payment for subscription, account renewal or account upgrade, you will receive an email with a link over the provided payment notifications email address that will redirect you to the "Invoices" panel.